Since my previous blog posting, none of my outings have met my criteria for being interesting enough to merit a standalone report. 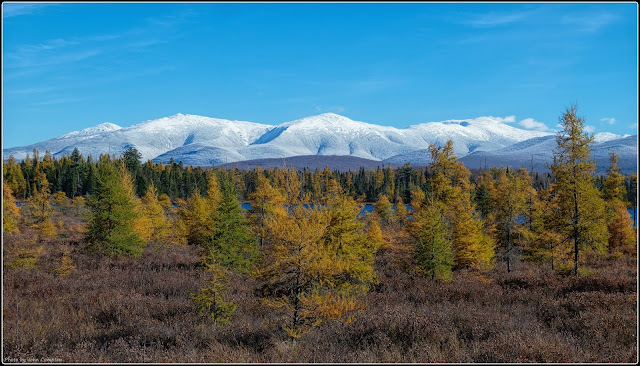 And so, this posting will simply consist of a series of photos taken during my wanderings in New Hampshire and nearby Maine during the Autumn of 2018. With two exceptions, the photos presented below were taken at various locations in the State of New Hampshire. The exceptions are photos #8 and #9 which were taken just a short distance across the border in the neighboring State of Maine. My first hike of the 2018 autumn season was in late September. 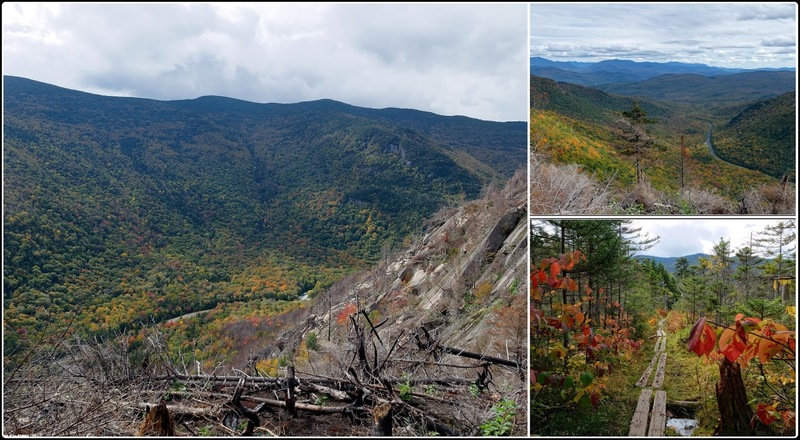 I began at the south end of the Kinsman Ridge Trail in order to access the upper end of the Dilly Trail which had been closed since autumn 2017 due to a forest fire that caused severe damage to the area. A few days following my hike, Steve Smith did a similar trek and posted an excellent blog report about the fire and his observations. Click/tap HERE to access Steve’s report. 1) This collage presents three photos taken on my hike to the Dilly Trail. Some evidence of the forest fire can be seen at the bottom of the photo in the far LEFT panel. Some early signs of autumn can be seen in the UPPER RIGHT panel which shows a view from Dilly Cliffs looking eastward toward peaks in the Sandwich Range. 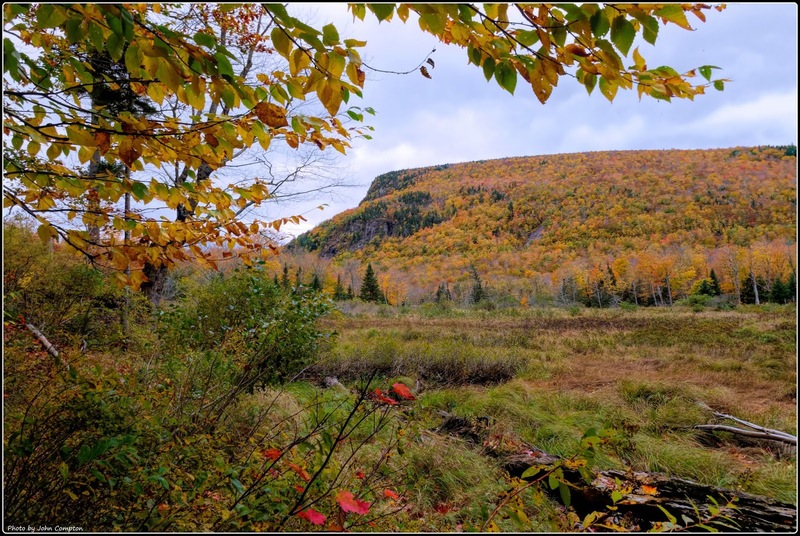 The bottom LOWER RIGHT panel features a bog bridge along the Kinsman Ridge Trail where the hobble bush had already transformed to its autumn colors. 2) This is another early autumn photo. 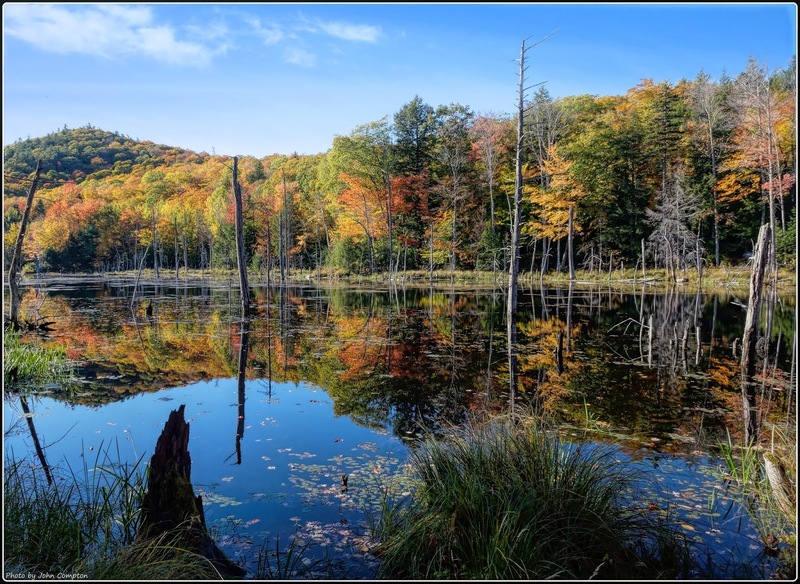 It was taken in late September 2018 at the beaver pond along NH 112 near the trailhead for the Beaver Brook Trail. 3) This photo was taken in early October 2018 when the autumn foliage was quite evident, but not yet at its peak. The location for this shot was the Willey House Site in Crawford Notch. The cliffs on Mt. Willard are near the center, and it is flanked by the slopes of Mt. Willey (at left), and Mt. Webster (at right). 4) This photo of colorful autumn foliage was taken in mid October from a clearing on the side of Abbot Hill. In the background is the Presidential Mountain Range. 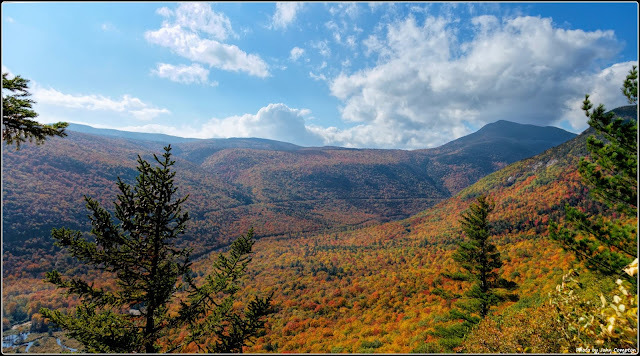 5) This photo was taken in mid October from an off-trail cliff at the south end of Crawford Notch. The large peak seen in the distance at the far right is Mt. Willey. 6) Here is another photo taken in mid October. It was taken from a point along the Dry River (easy to see where it got its name). I particularly like the white birch trees along this segment of the river bank. 7) This photo was also taken in mid October. The location was an off-trail wetlands area near the south end of the Saco River Trail. The Frankenstein Cliff ridgeline dominates the scene. 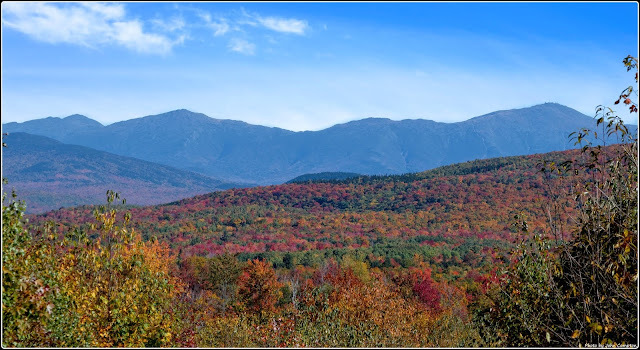 8) This photo was taken just a short distance from the New Hampshire border in the neighboring State of Maine. 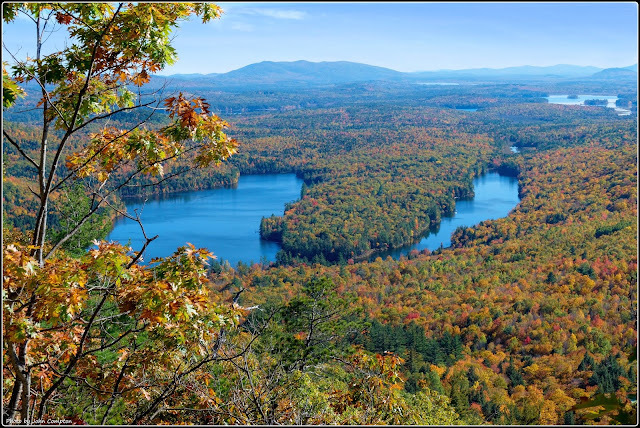 In mid October, I did a short (but steep) bushwhack to ledges on Stiles Mountain where there is this view overlooking Horseshoe Pond. 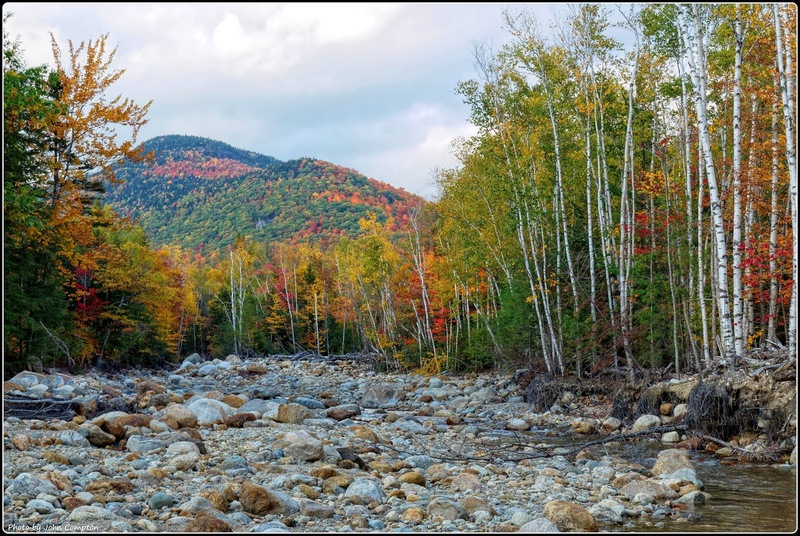 9) As with the previous photo #8 shown above, this was taken in the neighboring State of Maine in mid October at a location not far from the New Hampshire border. The body of water shown here is located along Deer Hill Road and is simply named Wildlife Pond. 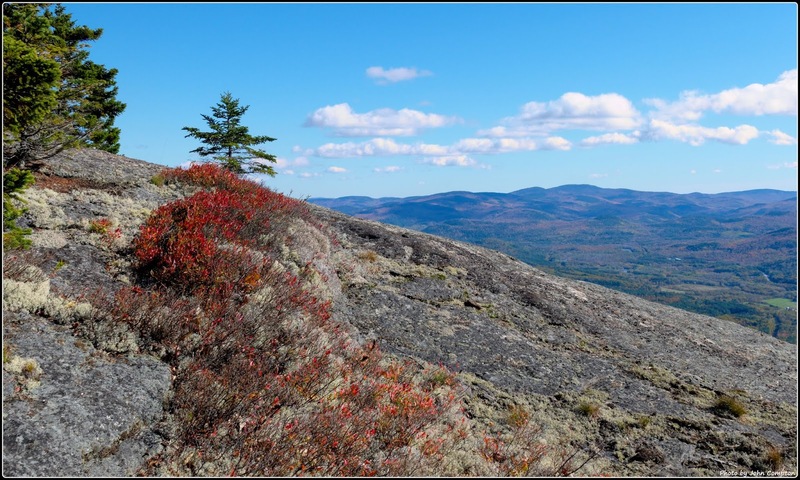 10) This photo was taken in late October from the Bald Cap Peak ledges (near Shelburne, NH). Perhaps the most noteworthy feature seen here is the patch of wild blueberry bush that is all decked out in its brilliant red color. 11) When this photo was taken in late October, there were more leaves on the ground than on the trees. 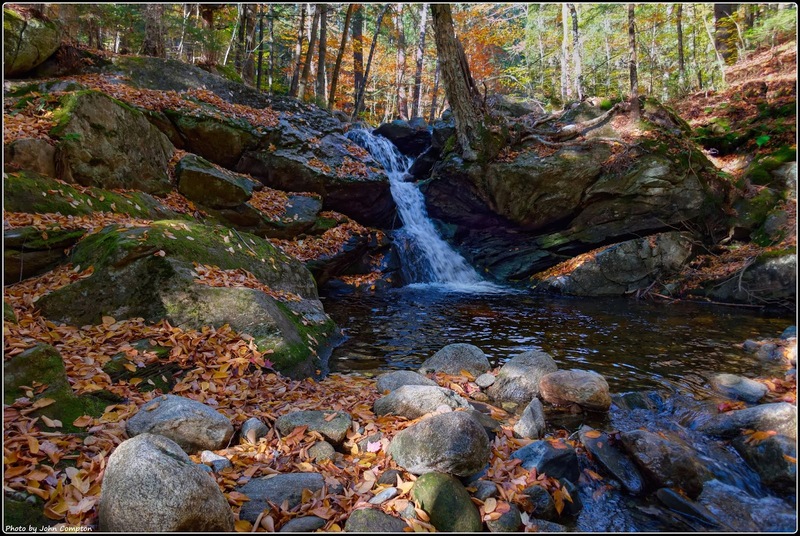 Featured in this snapshot is a small cascade that is sometimes referred to as Black Brook Falls. 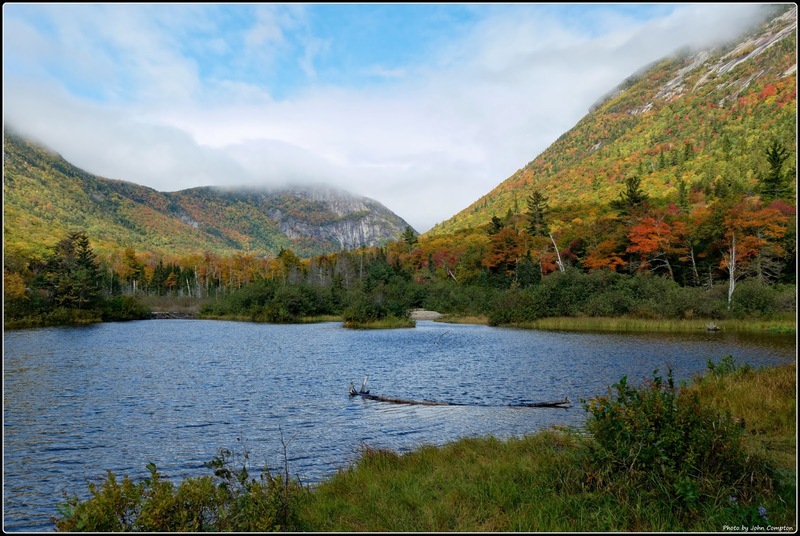 It’s located about a half mile off NH 112 and is reachable by following the old (now abandoned) Beech Hill Trail. 12) This photo was taken from my side yard on 18-Oct-2018 when the first dusting of snow was experienced in my neck of the woods. 13) This final autumn photo of 2018 was taken on October 26th from the Pondicherry Wildlife Refuge. Snow had already covered the high peaks, and the needles on the tamarack trees had turned to their brilliant shade of yellow. Just gorgeous, John! I especially like the photos with water in them, and with the leaves reflecting in the water. 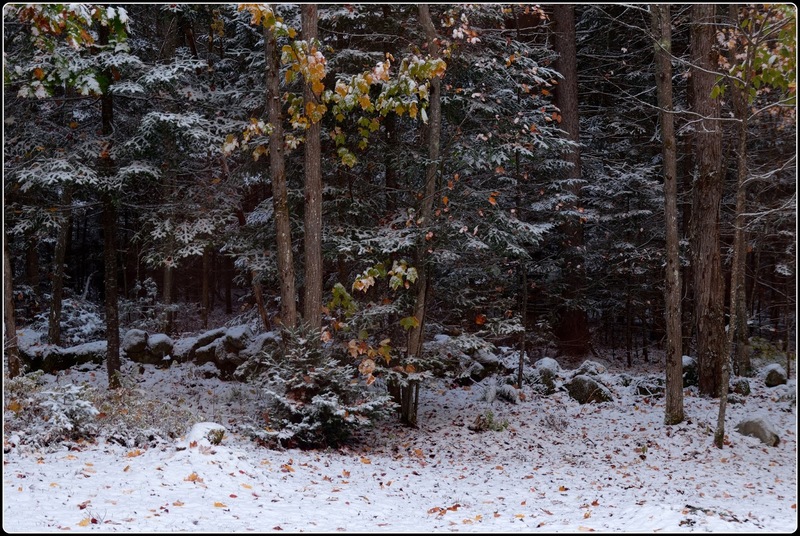 The first snowfall at your home is nice too. Well...they're all great! I just love New England in the fall. And I totally agree with the line written by Lucy Maud Montgomery. Thanks for sharing this visual treasure trove. Rita, thank you for reading my blog and for your thoughtful comments. I am very appreciative of you being such a faithful follower of my postings.